This is a guest post from John A. Ledingham, PhD. He and his new custom drum set reside in Columbus, Ohio. 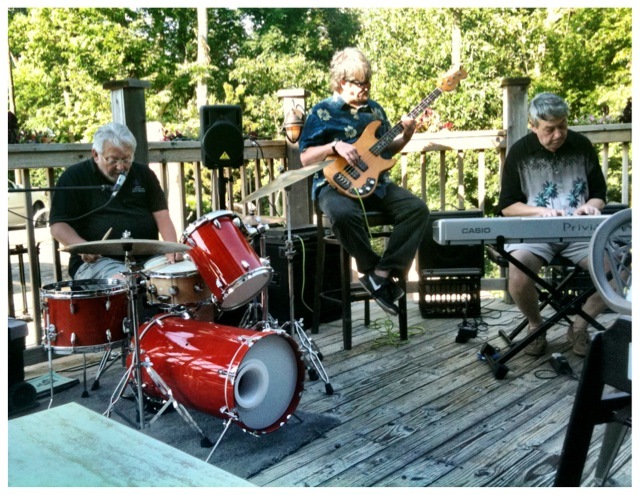 I started out not as a drummer, but as a bass player in my hometown of Springfield, Ohio. One Thursday afternoon, the leader of a group I was playing bass with called to tell me the band had been hired for a six-night-a-week gig, scheduled to begin the following Monday night. However, “Eddie” wanted me to play drums, not bass. In fact, I had an older set someone had given me to settle a debt and I had been practicing playing on them for fun. I tried to explain to Eddie that I was nowhere close to being ready to play a drum gig. “If you want the gig, you play drums,” Eddie insisted. When Monday came I was able to get by on the drums, but only barely. That was almost 50 years ago and I’ve been playing ever since. My earliest influences were guys who were masters at playing brushes; Shelly Mann, Shadow Wilson. Later on, players like Art Blakey set a pattern for me. I also played tenor in a Drum & Bugle Corps, which helped develop strength in my hands and wrists. This past Spring, I retired from my position as a university professor, which gave me time to pursue something I had long wanted to try — to build a custom set of drums. I had been impressed with kicks I had seen jazz drummers use in the late 1950s, ones with a smaller diameter, and deeper than normal. Once I learned that drum shells could be ordered, I had been anticipating building my own custom set. In addition to the visual appeal of a smaller, deeper kick – and the necessity of an acceptable “bass sound” — I also wanted the kick to be light in weight. Most of my playing is in smaller groups, and I wanted a “mellow” sound in the kick, rack tom and floor tom, while maintaining the crisp sound of my DW snare. Finally, I wanted a set that would not look like a standard kit. With this in mind, I ordered a 14 ” (diameter) by 24″ deep shell through one of Keller’s distributors to determine if a small, deep shell that holds approximately the same amount of air as a larger shallow shell will produce a similar sound. Moreover, I wanted to hear what a 14″ X 24 ” drum would sound like before committing to building a full set. With the help of Matt at drumfactorydirect, I was able to decide on particular lugs and tension rods, rims and heads. The shell arrived as specified; no support rings. Bearing edges cut for warmth rather than explosiveness. Ready for finishing, whether stain, paint or covering. My first task was to drill the holes needed for attaching the lugs. As I read more and more about building a “jungle set,” as these smaller kits are sometimes called, I found that most experts recommend finishing the drum (stain, paint or covering) and then drilling the needed holes. Instead, I had visions of a drill slipping and ruining a completed shell, so I decided to do the necessary drilling before finishing the shell. In my haste, I did a terrible job of drilling, including scratching the shell. Nonetheless, I finally was able to drill two holes for each lug. While not perfect, they were somewhere in the range of functional. One interesting note on the lugs: they do not come ready for attaching; instead, they have a spring and a small triangular piece of hard material that holds the spring in place and both must be inserted into the lug for it to act as an anchor for a tension rod. It is a time-consuming and tedious process, but it has to be done. With lugs, tension rods, heads, and rims in place, the kick proved capable of producing a lower register, full sound. It was, admittedly, not the sound of an 18” diameter kick, or even a 16”, but it was plenty acceptable. Encouraged, I ordered additional shells. For a rack tom, I decided to go with a 10 ” diameter shell for lightness, but with a depth of 13″ to produce a range of tuning preferences, and to pursue that different look. Instead of using the shell I had just completed as the kick. I ordered another “bass drum” shell, the same size as the prototype. This time I asked the vendor to drill the holes for attaching the lugs. Here, we ran into some problems; the vendor’s drilling machine broke down and split the shell. Finally, however, new shells arrived at the vendor’s and were drilled. I mention this because it is not atypical. Things happen, and then more things will happen to frustrate your efforts to build a set, despite the best efforts of everyone involved. I’ve ordered tension rods too short, rims with fewer holes than needed and had to return a tom holder that was not the one I should have ordered in the first place. All of these errors slowed the process of completing the set, so patience is an important element of enjoying the custom building process. Let the pro’s do it. Unless you are set up to cut bearing edges, and to drill the holes needed for various hardware, don’t do it – let the pro’s do it. The cost is minimal and the time saved is tremendous. And, the pro’s will do it correctly the first time. With the holes drilled the next step was to stain the drums. I decided to use the prototype shell (14 ” diameter X 24 ” deep) as the basis for a floor tom, and ordered a new shell for the kick, pre-drilled, with edges cut and with a reinforcing ring at each end, along with the shell for the rack tom. 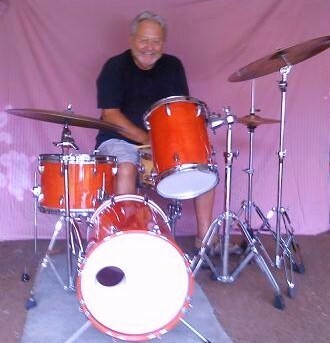 Next, I sought a source for the “burnt orange” stain of my Gretsch drums. I contacted Gretsch, but they declined to sell me any stain or to tell me what ingredients to mix to produce “burnt orange”. Other experts in the craft were unable or not inclined to get involved. However, a mutual friend introduced me to Jeff Assman, head of The Painting Company, of Columbus, Ohio, an organization that specializes in large-scale painting jobs, including The Ohio State University football stadium, and other major facilities across the U.S. Within 10 minutes of meeting, Jeff was able to match the color of the Gretsch tom I had brought along. And, within a few weeks the shells were stained and finished. I then attached lugs, mounts, rims and heads. Originally, I fitted the batter end of the kick with an Evan‘s head, but the sound seemed muffled and the head was slow to respond. Replacing the Evans head with an Aquarian helped reduce response lag, and produced an acceptable “bass drum” sound. The rack tom needed minimal attention. I mounted it on a cymbal stand with a RIMs system and tuned it as usual. Now came the 14” X 24” shell that was the prototype for the kick, but which now was to become a floor tom. Cutting above and below my drilling errors produced a shell for the floor tom 14” in diameter by 10” deep. New holes were drilled and lugs attached along with a new Evans head on top and an Aquarian head on the bottom. It already has become one of my favorite drums. #2. Although we didn’t break down the costs here, you can produce a set of drums for a few hundred dollars, comparable to drums costing thousands of dollars. #3. You can choose at any juncture in the process to take on tasks such as drilling, sanding or whatever, or to hand that task over to a professional – usually at a very low cost. #4. Make friends. There are many people around who have already gone through this process and all of them are eager to help. In my case, these included Jeff at The Painting Company; Chris White, of Columbus Pro Percussion; and fellow drummer James “Smooth” Eliot, whose support and enthusiasm for the project never waned. #5. Building a custom set is fun. Always remember to have fun with the process, and the fun you have will be reflected in the drum set. Forever. Thanks John for your incredible insight into building your first custom drum set! If you enjoyed what John shared, or if you have any questions for him, please leave a comment below! If your ready to start building your very own custom drum set consider checking out the eBook to set you on the fast track to building drums! Congrats, John. They look and sound great!